Most of you Heard About Dream11 & Played and also Earned Good Amount From It. 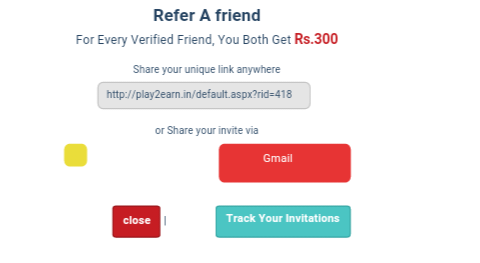 Now Play2Earn Same as Dream11 has Comeup with Same Offer Where you can Earn 100 Rs on Signup + 100 Rs Per Refer!! Read Full Post & Join From Below link to Earn Like Hero!! So Join & Start Earning!! How to Earn From Play2Earn ? • Now here you will the recent upcoming matches you can participate in. • Click on “Show” and you will see the list of matches. • Now you will be given 100 credits which can be used to select 11 players of your choice – The players you feel which perform the best in that match. • Make sure you use all your cricketing knowledge like the recent form of the players etc so that you choose the best players. • You also need to select a Captain & Vice-Captain for your team. Their points will be 2X and 1.5X respectively. So select them carefully – It means 2 best players you think for the match ! • Upload your PanCard and Bank Account Details here which are necessary for your verification and sending you payments. • Few participants with highest number of points will get real cash which is transferable to bank account. Taking part in Fantasy League requires money but you can get that for free by referring your buddies. Yes, you get Rs 100 For each friend who joins through you and verifies his account. You can use this Rs 100 to take part in league and win real cash and redeem in bank account. • Now once your friend joins through your referral link, both he and you will get Rs 300 in your PLAY2EARN account after verification of PanCard, mobile number and bank details. • You can earn unlimited Cash Balance like this. • The cash balance can only be used to join paid leagues on PLAY2EARN.com But the winnings from these leagues can be withdrawn as cash into bank account after 90 days of earning it.